VJ Books Presents Author Mark Greaney! 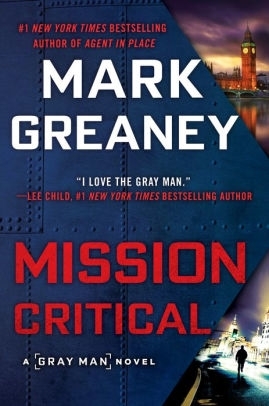 Mark Greaney's debut international thriller, The Gray Man, became a national bestseller and was nominated for a Barry Award in the Best Thriller category. The follow-up Gray Man thriller, On Target was also nominated for a Barry Award in the Best Thriller category. Ballistic, the third in the series also received glowing reviews including a rave from the New York Timescomparing flipping the pages of the Mark Greaney thriller to "playing the ultimate video game!" Mark's fourth Gray Man thriller, Dead Eye, was released December 3rd, 2013. A feature film adaptation of The Gray Man is in development by Columbia Pictures, with Joe and Anthony Russo of Captain America, Winter Soldier, to direct. 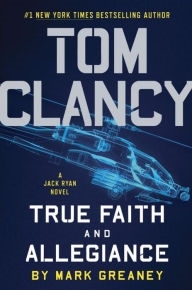 Although Tom Clancy died more than a year ago, the Jack Ryan series lives on with Mark Greaney. 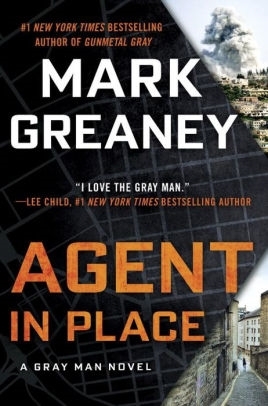 Tom Clancy novels written or co-written by Mark Greaney include Locked On, Threat Vector, Command Authority, Support and Defend, Full Force and Effect, Backblast, Gunmetal Gray, and Agent in Place. Mark has a degree in International Relations and Political Science. In his research for The Gray Man novels he has traveled to more than fifteen countries, visited the Pentagon and many Washington, D.C. Intelligence agencies, and trained alongside military and law enforcement in the use of firearms, battlefield medicine, and close-range combative tactics. Author Signed Hardcover Book. December 2013 NY: Putnam First edition, first printing, mint, new/unread in a flawless dust jacket, signed by Mark Greaney. Each dust jacket is protected in an acid-free archival quality acetate cover. Author Signed Hardcover Book. December 2015 NY: Penguin First edition, first printing, mint, new/unread in a flawless dust jacket, signed by Mark Greaney. Each dust jacket is protected in an acid-free archival quality acetate cover. Author Signed Hardcover Book. December 2014 NY: Penguin First edition, first printing, mint, new/unread in a flawless dust jacket, signed by Mark Greaney. Each dust jacket is protected in an acid-free archival quality acetate cover. Author Signed Hardcover Book. July 2014 NY: Penguin First edition, first printing, mint, new/unread in a flawless dust jacket, signed by Mark Greaney. Each dust jacket is protected in an acid-free archival quality acetate cover. Author Signed Hardcover Book. December 2016 NY: Penguin First edition, first printing, mint, new/unread in a flawless dust jacket, signed by Mark Greaney. Each dust jacket is protected in an acid-free archival quality acetate cover. Author Signed Hardcover Book. December 2016 NY: Penguin First edition, first printing, fine in a fine dust jacket, signed by Mark Greaney, remainder marked. Each dust jacket is protected in an acid-free archival quality acetate cover. Author Signed Hardcover Book. February 2018 NY: Penguin First edition, first printing, mint, new/unread in a flawless dust jacket, signed by the author. Each dust jacket is protected in an acid-free archival quality acetate cover. Author Signed Hardcover Book. February 2016 NY: Berkley First edition, first printing, mint, new/unread in a flawless dust jacket, signed by the author. Each dust jacket is protected in an acid-free archival quality acetate cover. Author Signed Trade Paper Book. 2011 NY: Penguin First Trade Paperback edition, first printing, mint, new/unread in a flawless pictorial wraps, signed by the author. Author Signed Trade Paper. December 2013 NY: Penguin First Trade Paper edition, first printing, mint, new/unread in pictorial wraps, signed by the author. Author Signed Trade Paper. December 2013 NY: Berkley First Trade Paper edition, later printing, mint, new/unread in pictorial wraps, signed by the author. Author Signed Hardcover Book. February 2017 NY: Penguin First edition, first printing, mint, new/unread in a flawless dust jacket, signed by the author. Each dust jacket is protected in an acid-free archival quality acetate cover. Author Signed Trade Paper Book. February 2017 NY: Random House First large print trade paper, later printing, mint, new/unread in a flawless wrappers, signed by the author. Author Signed Hardcover Book. February 2019 NY: Berkley First edition, first printing, mint, new/unread in a flawless dust jacket, signed by the author. Each dust jacket is protected in an acid-free archival quality acetate cover. Author Signed Trade Paper. September 2014 NY: Penguin First Thus edition, first printing, mint, new/unread in a flawless pictorial wraps, signed by the author. VJ Books Price $19.99 --> What is a First Thus? Author Signed Hardcover Book. July 2019 NY: Berkley First edition, first printing, mint, new/unread in a flawless dust jacket, signed by the author. Each dust jacket is protected in an acid-free archival quality acetate cover. 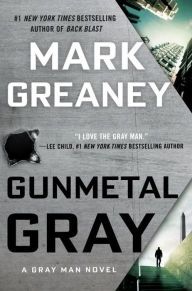 Click Here to Listen to Mark Greaney Talk about his Novel "Gunmetal Gray"
Click Here to Listen to Mark Greaney Talk about "True Faith and Allegiance"